It’s Sunday afternoon. We’ve recovered from our early Christmas celebrations on Saturday night and I want to take some photos of Paris in its end-of-year finery. 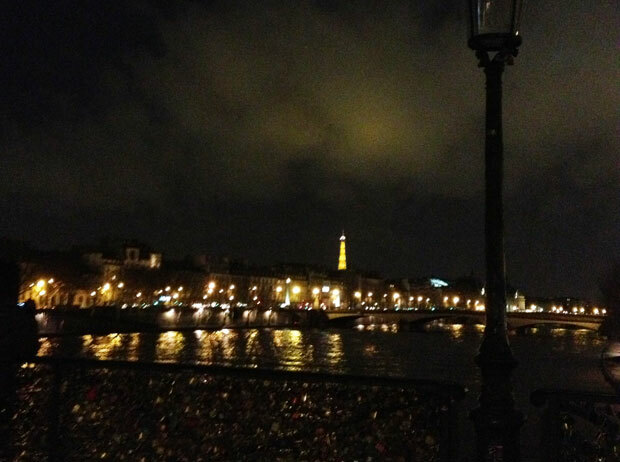 Our first stop is the Pont des Arts, shiny with lovelocks. It’s nearly 6 pm so we wait, with a number of other people, for the Eiffel Tower to shimmer and shine. I regret not having taken the camera, just the iPhone because the result isn’t quite what I hoped. 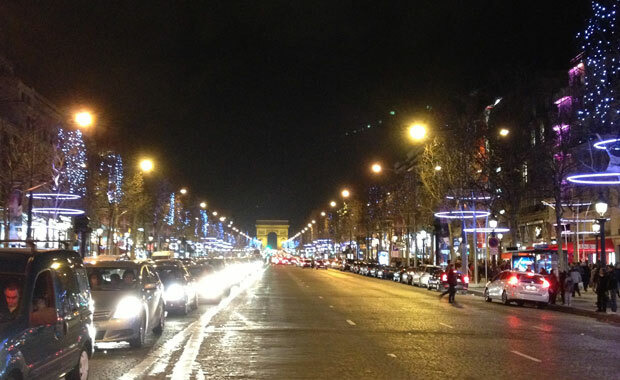 We then decide to walk to the Champs Elysées along the Left Bank of the river. We walk down to the water’s edge and past the Calife and look back at the bridge with Pont Neuf in the distance. We go up the next lot of steps and past the closing bouquinistes who are all selling lovelocks of every shape and kind. It’s become a real business! As we go past rue de Seine, Relationnel remarks that it’s very rare to see Christmas decorations in the streets of Paris, unlike the provinces. We can now see the Louvre on the right and Big Wheel on its left, having moving from its summer spot near the Louvre. As we get closer, we see a lit-up pencil shape and wonder what it is. We cross over via the Solferino pedestrian bridge and realise that it is a Christmas tree, apparently the largest in Europe. 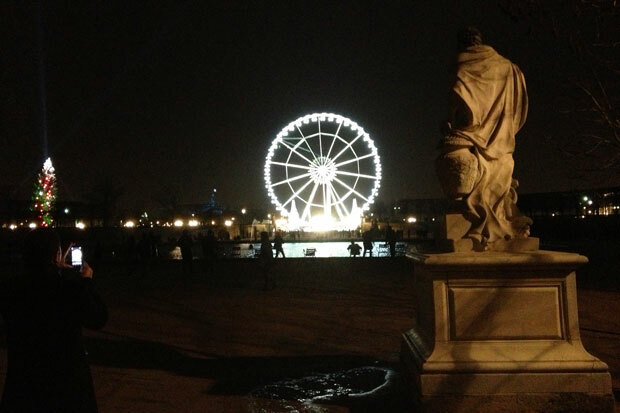 We walk down the Tuileries towards the Big Wheel avoiding the enormous puddles and are amazed by how commercial and popular the wheel has become in recent years. I think one of the reasons is that the cabins are closed in now. I’m annoyed about my fear of heights because the view from up there must be amazing. As we cross Place de la Concorde towards the Champs Elysées, we’re suddenly in a huge throng of people all attracted by the so-called Christmas market. We’ve been there before though and haven’t found anything interesting – no handicrafts, just a lot of cheap food and factory-made items so we walk along behind the stalls until we reach Rond Point des Champs Elysées. The decorations are stunning and there are fewer people. We keep going until we reach Virgin and decide to go and buy a card for the camera. Despite the number of people, we also buy a couple of DVDs and a CD and don’t even have to wait in line to pay. CDs don’t seem as popular any more! By then, we’ve been walking for an hour and a half and my feet are killing me. We look around for a suitable café but all we can see is Starbucks and other similar places. We cross the road and I take the typical tourist photo of the Arc of Triumph halfway across and I see Ladurée in front of me. 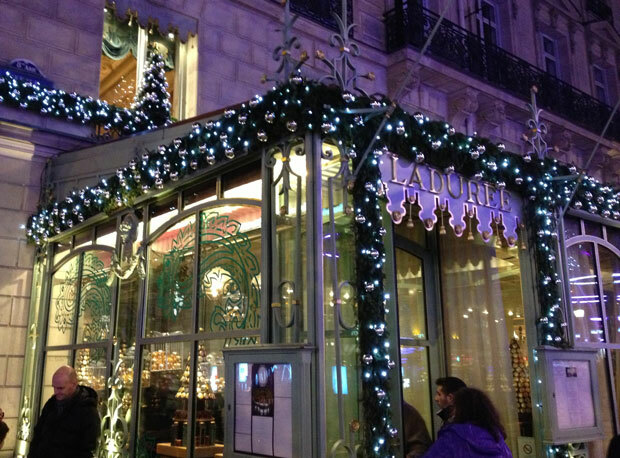 Now, strange as this may seem, I have still never been into Ladurée’s, famous for its macarons. We’re informed that the tearoom is closed (well, it’s nearly 7.30!). We have to choose between the restaurant and the bar. Well, I’m perfectly happy with the bar. Despite appearances, Ladurée Champs Elysées only opened in 1997 although the original bakery near the Madeleine dates back to 1862. The bar is decorated in what looks like authentic Art Deco and you sit on high stools that keep swinging around. We order a class of Saint Véran and a plate of tapas each. They aren’t really tapas, more like bouchées, but they’re delicious. I use my Evernote Food app for the first time and record what we’re eating: crab & mayonnaise puff, foie gras, candied aubergine, Provençales tomatoes and salmon prestige. When we come out, there aren’t nearly so many people, so we take the metro home to spare my feet. It’s good to be back in Paris! 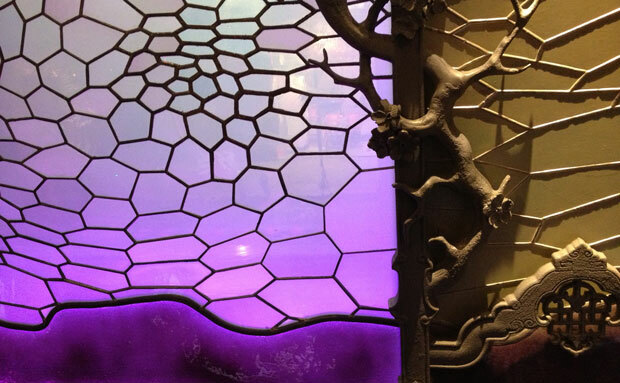 This entry was posted in Paris, Restaurants, Sightseeing and tagged Eiffel Tower, Ladurée, pont des arts. Bookmark the permalink. Wonderful photos, I can’t wait to visit Paris. Thank you Gigi and Lyn. And a very happy New Year to you both as well. 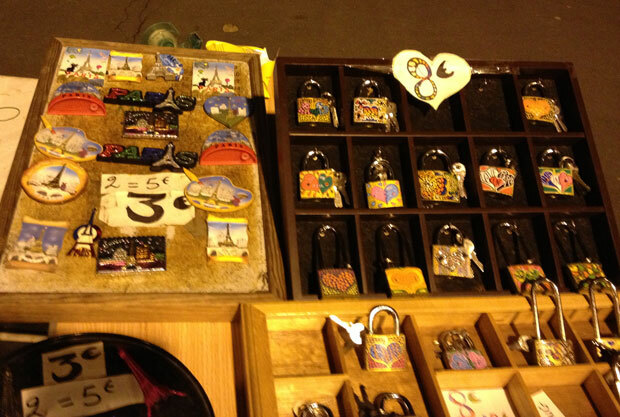 I’ve seen the vendors selling padlocks on the bridges but didn’t realize that the bouquinistes are selling them now. That’s business with a capital “B”! I only hope that they don’t replace their used books with a complete line of horrendous locks. Enjoy your time in Paris. I hope that the workman have taken some time off and that all is quiet at your apartment! I was actually very pleased to hear the workmen today because the scaffoldilng is scheduled to move over to the next balcony tomorrow. I’m keeping my fingers crossed. Christmas in Vienna has an appealing ‘ring’ about it and I’m thinking that one day I will do it as well as visit Paris ….. of course! Here we are sweltering in the tropics and although I don’t like very cold weather, I would love to do a cold Christmas and all the trappings again one year … in the not too distant future! 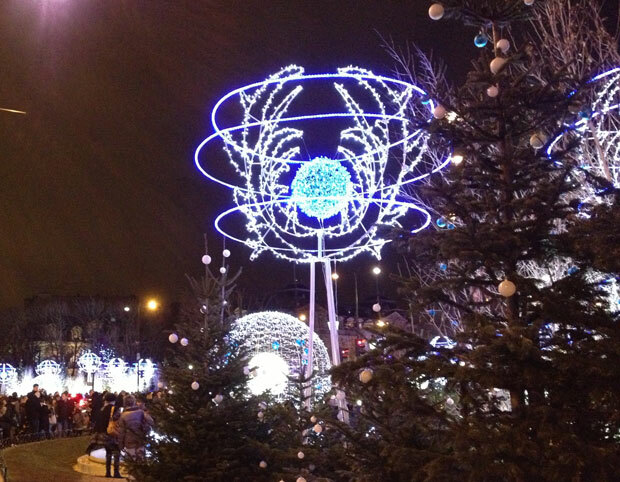 Thanks for the views of Paris at Christmas. It’s difficult to know the best place to spend a white Christmas. The villages in Germany are much prettier than Vienna, so maybe they would be a better choice.